Firefighters experience high amounts of physical and mental stress when attending an incident. Environmental factors like extreme heat, humidity or cold contribute to conditions that may have an adverse impact on a firefighters health. In Australia, heat stress has been highlighted as a leading cause of injury during fire suppression. Dangers like heat stress can be mitigated with the implementation of a rest and recovery strategy that includes measures like Active Cooling. Active Cooling is the process of using external methods or devices to reduce the bodies elevated core temperature. With this in mind, Blowhard have created an accessory that aids in Active Cooling. The Misting Ring transforms your Blowhard fan into an effective recovery tool that assists in combating heat stress. It takes just seconds to fit the Misting Ring to the front of a Blowhard Fan using the super strong, magnetic adaptor. 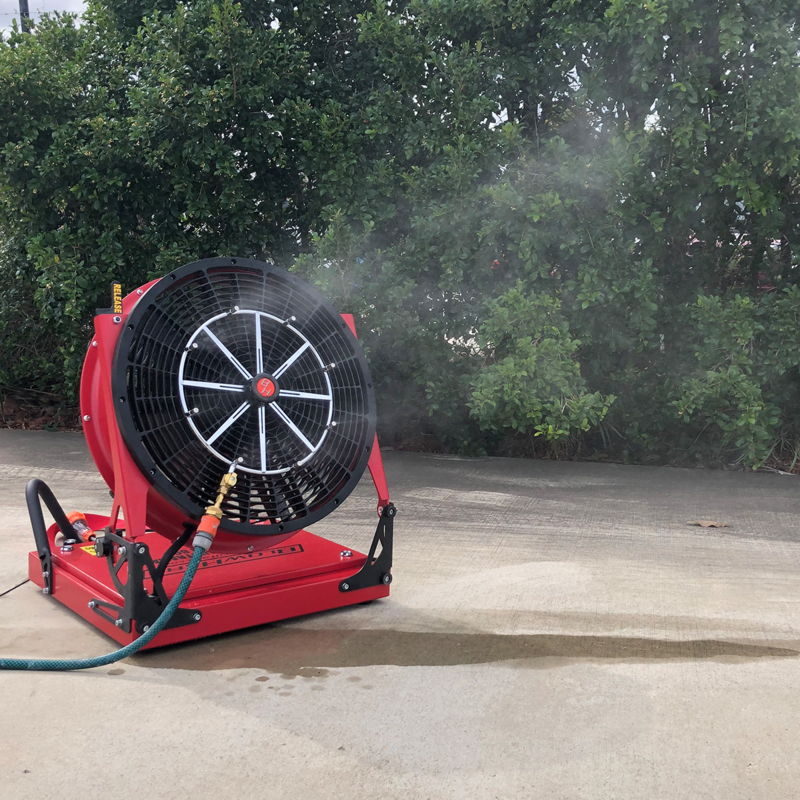 When attached to a regular domestic hose, the 8 low pressure nozzles create a super fine mist which aids in firefighter recovery by helping to lower the core body temperature after training or an incident. Need more information? Read more about the Blowhard Misting Ring and Blowhard Fan. Head over to our Facebook page and hit the “Like” button for our news to show up in your daily feed. Facebook not your thing? Subscibe to Newsflash the Pac Fire monthly newsletter here. Watch the Misting Ring in action, as well as other great tutorials on our YouTube channel.